<–to share this article with google, facebook, or twitter, please click the icons to the left! UPDATE: We just spoke with the Rhonda Wardlaw, PIO for the City of Annapolis. Wardaw said, “the City plans to make the payment.” When questioned as to why it was not paid, she said that it was “unfortunate” that they filed suit as conversations were ongoing. The would-be developer of the Market House has filed suit against the City of Annapolis. According to court records, Gone To Market, LLC (Lehr Jackson) is claiming that the City has refused to pay the $29,876.85 it was owed for work completed. Gone To Market, LLC was handed a pre-development contract by the City to develop the ultimate plans for the Market House. While it was a foregone conclusion that Gone To Market would be selected as the developer, the City explained that this was a separate contract and was not bond to any other agreement. Former Public Information Officer Phill McGowan explained that the contract was for Jackson (Gone To Market) to develop the plans and that the City ultimately would “own” the work produced regardless if he was selected as the developer. In February 0f 2011, Lehr Jackson and Gone To Market backed out of the development proposal amidst the public outcry, the revelation of financial inconsistencies discovered by Eye On Annapolis, and lack of complete support from the City Council. 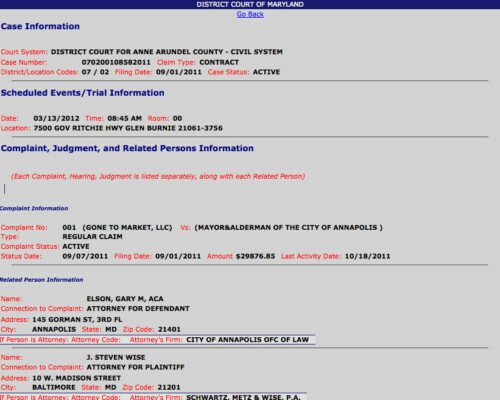 Eye On Annapolis has contacted both Lehr Jackson of Gone To Market and the City of Annapolis for comment. In other legal news, the lawsuit against the City from Eastern Waterproofing continues to drag out. Eastern Waterproofing is suing the City in another contract dispute surrounding the payment for work completed on the new police station several years ago. This suit is scheduled to have a Pre-Trial Conference in July 2012.